Thanks to a fellow forum member for giving me some centers for 35mm reels. This has allowed me to make two so far, with a third in the pipeline hopefully if I have time to make today. Up to now I have been using 2000ft reels, about 20 minutes of 35mm film, making these larger reels to a 3000ft capacity which the Ernemann2 projector can take, will in turn give me a chance of making up 30 minute worth of 35mm film of shorts etc. I found a new place for "tweety" as he keeps falling down. Making up some films yesterday...must run my Super8 version sometime soon. I asked him about it and he said he and his friend traded cars for the day. He said his friend works at Volkswagen. I told him he should find similar friends at Ferrari and Porsche! Judging from the bumpers it's from the 1960s. The ones made in the 70's had much simpler designed bumpers: just a curved chrome bar with a rubber strip. 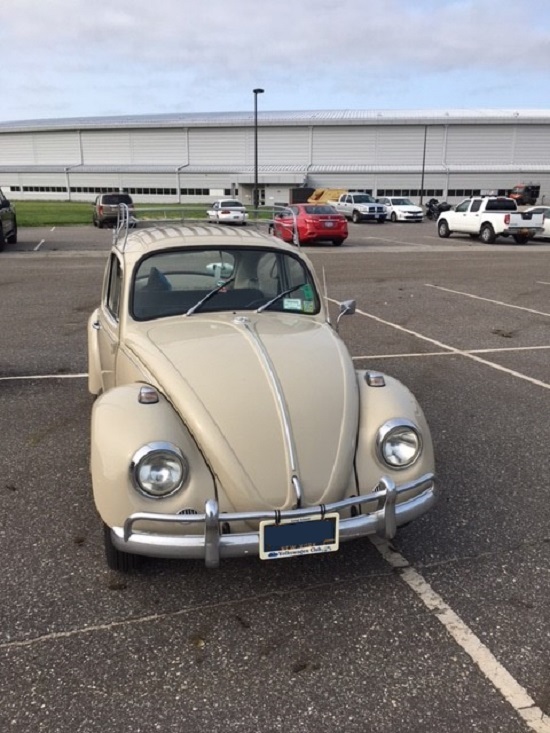 Edit: The 1966 (and earlier) bug had no reverse lights. The 1968 (and later) had them integrated into the tail lights. 1967 was the only year they were mounted separately on the rear bumper, so it's a 1967. My friend had a couple of old MG coupes (Neither consistently ran: they traded parts backs and forth and took turns!). He had a 6V car and a later 12V car. The 6V had a battery bay in the back floor behind the driver's seat. Did the 12V car have a bigger battery bay for a larger 12V battery? -it had a second battery bay for a second 6V battery behind the passenger seat and the two were strapped in series! The taillights remain small, the headlights transitioned to more of an upright positioned modern appearance and I would say 1967, but where did that chrome rear vent come from? I see some with it and some without. We're lucky here: the '67 had a number of unique features that make it easy to distinguish from other years. -this doesn't usually come so easily among VW beetles! I love the roof rack: makes me think of plaid suitcases, picnic baskets and stops at Howard Johnson's! This old ad made me smile....now here is a question ,once you are floating around in the lake as shown, how do you get back? I didn't realize there was a clutch on a "Beatle." The Fender can be replaced by Les Paul, but that is about it!!!! That chrome grill over the engine air vent seems to be a sheet metal overlay on the regular one. I could imagine somebody years ago mail-ordering it from JC Whitney! Does anybody remember the Rolls-Volks? This had to be the ultimate Volkswagen aftermarket accessory. Remember those engines were only held to the gearbox with about four bolts, although other things are connected as well, if you are properly set up for a quick clutch change, it can be done. These days being in my 60s it would take me longer... probably around 40 minutes. The Beetle is a great Hobbyist's car. Parts are common (either NOS, used or reproduction), they are as simple as a stone axe and are always good for a smile. -granted, by modern standards they are death traps, but nobody said you can't leave them in the garage until a sunny Saturday and drive something else the rest of the time! We used to camp with a guy who was a NYC bus mechanic. He restored a VW bus camper. This was basically a beetle engine pushing around a tiny house! He figured on going through an engine every couple of years. No big deal to him: he'd pull it out in the Fall and rebuild it in his spare time before the Winter was out. Our here some of those cars are now fetching good money in particular the old VW Kombi Camper. Going through my junk, I came across this little tin I have had since the late 60s. This is the stuff my old boss smoked, but in it are the range of shims needed to get he right valve clearance when working on cylinder heads. The last time any of those were used, would be around the 1972 mark when I worked on a Jaguar XJ6 4.2 litre twin cam cylinder head. They are also used on Hillman Imp OHC engines. I have a set of those steel ramps you drive one end of the car up to work underneath. Then my father in law passed away and I wound up with his pair too. -When our friends in Brooklyn decided to give us theirs I put a stop to it! I remember one time my friend parked his Beetle in a very slanted way. Rather than re-park it, four of us lifted it into a straight parked position. If I have this correct, and I can't explain how a colleague of mine refurbished his VW Van (Vanagon?) with a Porsche engine. Is there some kind of similarity with Porche and VW engines? Please explain. Cant help you much Michael as I have never come across one, but anything is possible. Apart from both engines being air cooled there is probably a lot more to it than just a simple swap. Although this particular car in this interesting video has been modified, they still went like a rocket. No pictures but not a good start to the day when the smoke alarms went off at 4am. I traced it to the cellar and called the fire brigade. It looks like the dehumidifier there had caught. No serious damage (except smoke to the rest of the house) though the electrics are out downstairs and a few old bottles of home made wine got smashed. The paramedic and ambulance crew checked me over and apart from initial high blood pressure everything seems OK. No films were damaged. Now to get the carbon off everything!!!!! Thanks for the videos with the comparisons. My colleague's VW had that get up and go speed without the skidding. The second shot after the VW passes through the curve had the impressive rocket speed in his model too. 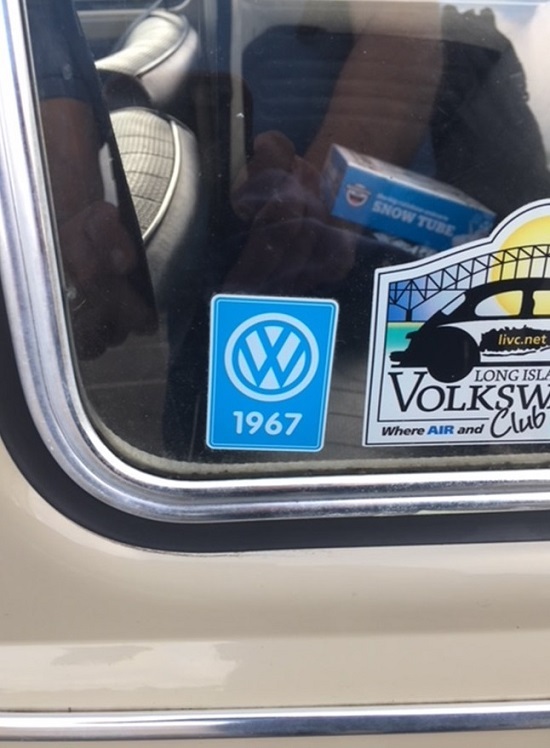 Thanks for verifying the model is a '67. 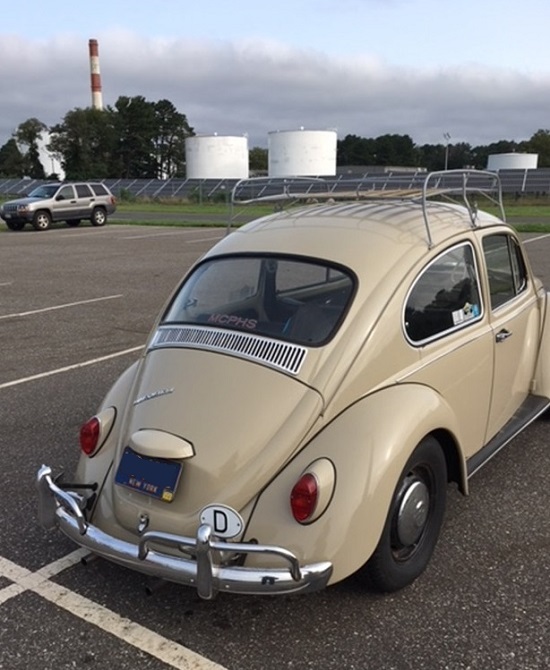 My first car when I lived in San Francisco was a used VW Bug with a sunroof. Loved that little car and it had a lot more room on the inside that you would think. I sold it for a new Ford Pinto and then after I got married we sold the Pinto for a Datsun 260z. However performance-wise it didn't live up to the expectations of it predecessor 240z. Graham...Did the 260z model last more that 1 year? I know it wasn't long before they came out with the 280z. We're glad to hear you came through it all right! Life is never boring (even if sometimes we wish it would be!) Something new is always coming up. We had a lightning strike in the neighborhood last week. It was close: sounded like Santa was up on our roof firing a mortar! We had phone service back in a day, Internet back in two, our new TV is in a box sitting in front of me, I'm still looking for a stereo amp that will drop in where my old one was, and the check is on the way from the insurance company! -Can't say nothing ever happens here! Glad you hear all is ok, it also shows the importance of having smoke detectors in the house. There has been many tragic cases of loss of life in the past without them. I only came across the 240z in Scotland, when I came to NZ I did work for a Datsun agent, however never had much to do with the 240z mostly they imported the other Datsun models, I worked there until I moved to AVIS in late 1975, there it was all British or Australian cars. I did a check on google and it does appear the production run for the 260z only lasted a couple of years. Compared to the 240z the 260z performance was reduced to meet the US emissions regulations that came into effect at the time. If I have read it right, the 260z was replaced by the 280z around 1975, and to boost its performance, a Bosch designed electronic fuel injection was added. For me "Datsun" fell of my radar as I moved to Aviation from AVIS around the 1976 mark. In saying that, it would be great to once again have a drive of the 240z that's if I could handle its impressive performance. I took this photo of the inside of a Eumig S932 running after working on it. However later in the day, I looked at the photo and saw "Tweety" looking at me through the projector....strange I thought "Tweety" must be keeping an eye on me. Do you think all this projector and film stuff make people a bit crazy? 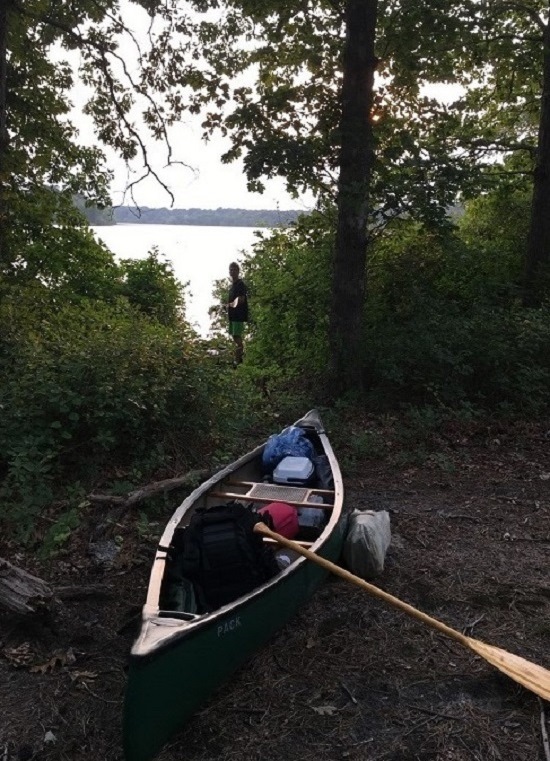 Well, after many years we finally pulled of a local canoe camping trip last week. The deed itself is no big deal: simply paddle to a campsite with a bunch of camping gear and set up house overnight. It’s done this way all over the world: people often travel for days on end this way. It’s just a smidge of pioneer living you can enjoy and then put away until next time. It’s commonly done in upstate New York, Maine and Minnesota and throughout Canada, it’s done in Europe and Australia too, it’s just not often (or ever) done here. Long Island is a place with a lot of variety: the West End is Brooklyn and Queens and very much part of the City of New York, along with subways to Manhattan and bridges and tunnels to the Mainland, high-rises, sports stadiums and city parks. 120 miles away the East End is the Hamptons and farms and vineyards and boating, fishing and beaches. In between you have almost eight million people doing anything and everything you can imagine in modern American life, whether for better or worse. I grew up camping. My parents started taking us when I was 5 years old. Most of the time, we are what are called “RVers”. We have a folding camper and a couple of times a year we go to a campground somewhere and relax around the campfire for an evening. We belonged to a camping club for decades and some of my best friends and best memories came from those weekends away. Today when we camp it helps me celebrate those days and my parents too. This is low level adventure: there is running water and electric power if you want it. Many commercial campgrounds these days have cable TV hookups and WiFi! There are sometimes swimming pools. This is just fine for the typical family adventure, especially when there are small kids involved or when you want to do it for more than a few days, yet is it possible to take it further. The next level is up there with back packing and canoe camping: basically living with what you can bring under your own power. There must be less stuff and it must be compact and lightweight. I’ve been doing what can be called canoeing with camping: a car towing a camper, with canoe(s) on the roof rack. I camp near a lake, carry the boat down to the water and paddle around for a while, yet still sleep on a mattress not down at ground level. I like doing things other people aren’t doing. For example, I like the idea that when I light up a screen with a movie on film, there’s a decent chance that among the tens of thousands of people living around me, exactly nobody is doing what I’m doing. That makes it MY thing! I’ve done canoe camping a little up in Maine, just maybe if I managed locally I’d get that same satisfaction. Canoe camping is simply not done locally. Yes: there is camping. Yes: there is canoeing. There is even camping with canoeing, but camping from a boat is simply NOT a thing here. 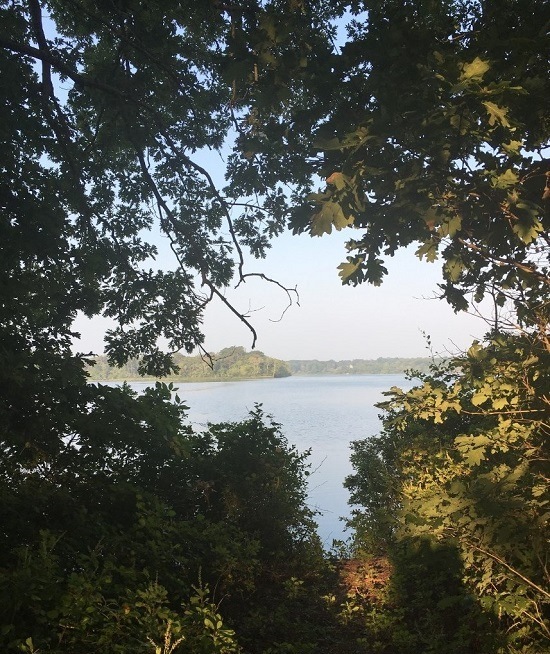 There are no (official) wilderness campsites, because there is not a lot in the way of true wilderness. You might say it’s just not part of the local culture: the idea of “Let’s do this” or “Let’s promote this” just isn’t there. It’s more “What IS this?” and “Go Upstate!”. Years ago I decided I wanted to be the exception here, so I took my boat and started looking at islands in the local rivers. One day I struck gold: a clearing inside a wooded island. Somebody, maybe years before had the same idea I (eventually) did: the entrance was fairly hard to find and there was a fire ring in there made from stones obviously from someplace else. I forgot about it while my son was very little, but went there again a few years ago and found it was being reclaimed by the forest. Since then we’ve brought some saws and shears over and made it a campsite again. We named it “Camp Mason” in honor of Bill Mason, one of my favorite filmmakers. Last week we finally got around to really camping there, not just having lunch or building a fire and hanging out for a while. My wife stepped in here: she dropped us off, went home and then picked us up the next day: in honor of Neil Armstrong we called her and the car “the Command Module”. -There must be an overnight stay. Without that it’s basically a picnic! -Everything we need we bring with us and take away too: stash no supplies and leave no mess! -There must be meals cooked and served there: no delivered pizza or sneaking off to McDonald’s! The first impression here is how sluggish a 33-pound boat becomes when you add in maybe 50 pounds of gear (Firewood is SO heavy! ), but we paddled about a mile and a half and hauled out. Then comes the setup. 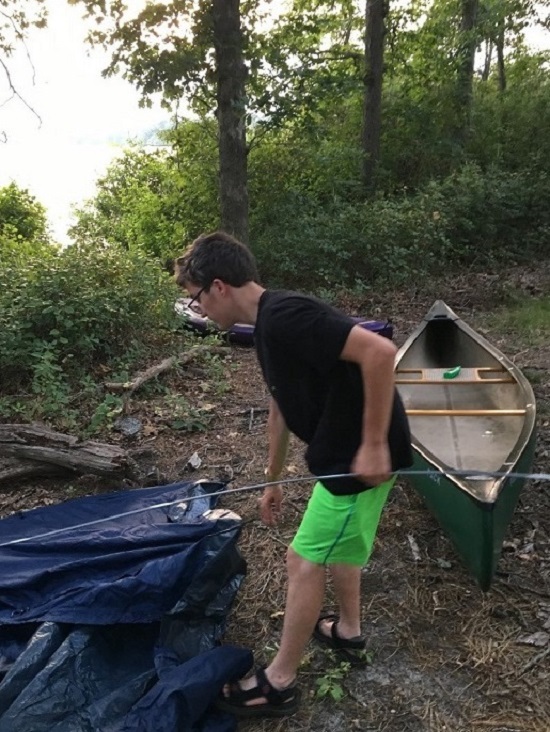 Based on his 15 years camping with us and years in Scouting, Steven did a great job setting his own tent up, even though this one was brand new to him. The two of us have a tradition going back to when he was in Kindergarten. I have a decent sized Thermos that holds two cans of Spaghettios and keeps them hot for many hours. When he was little and we went on a hike, I’d pack this along with some spoons and bowls and we’d have a trailside meal. Years later, be it a hike or a long bike ride or a canoe trip, the thermos, spoons and bowls still come along. If someday, years from now you hear about a middle-aged man showing up at a nursing home with a Thermos full of Spaghettios, you just may understand why! This is how we started out that night: just some quick chow after the trip over. Soon the sun set. We got a campfire going and the evening meal continued! 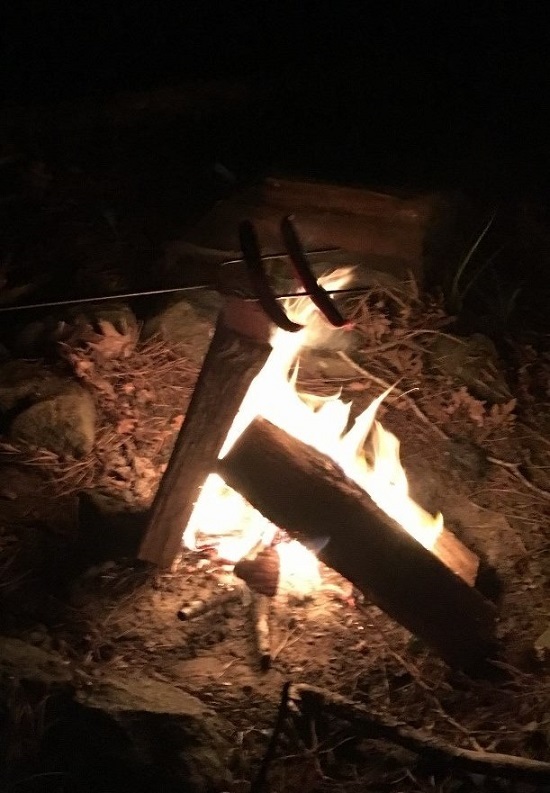 There’s just something about hotdogs over a fire. The wood smoke adds a little more flavor, but I think more than anything it’s the ritual! We do grilled-cheese sandwiches on the fire too. This involves the use of a pie iron: basically a cast iron clamshell mounted on two long handles. This is put directly on the hot coals. 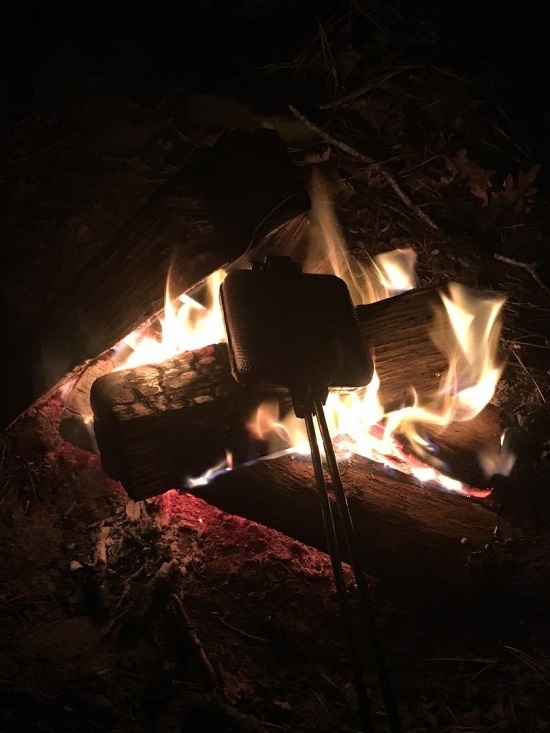 At night it’s a two-man operation: one has to operate the pie iron, taking it out of the fire often to see how the sandwich is coming along and the second one to operate the flashlight and have the plate ready for the end results. The major safety tip here is to remember that “pie iron” sounds a lot like “branding iron”, and that’s no coincidence! Unless you want to explain a really weird scar for the rest of your life (“ROME PIE IRON”, mirror imaged), you should learn to respect this thing! What’s a slight injustice is the iron is meant for square bread, but I like rye bread! 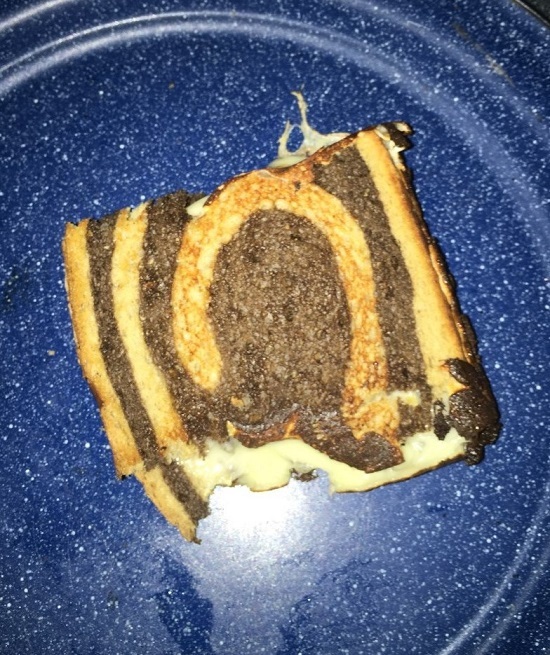 My sandwich looked like this! By the fire, we talked a lot: he’s a teenage boy and for him life is going by at a crazy blur. I’m well along in middle age: Ditto!